Down Goes Brown: The Golden Knights finally have a name and a logo. How'd they do? The Golden Knights finally have a name and a logo. How'd they do? After several months of waiting, followed by an additional several weeks of waiting for reasons nobody was quite clear on, and then a few more minutes of waiting while they tried to figure out how to get their video to play, the NHL’s newest expansion team finally has an identity. They’re the Golden Knights, as unveiled Tuesday night at what the league hyped as “historic event”. Of course, we kind of already knew that; the name had been rumored for a while now, thanks to the team filing for trademarks on various Knight-related monikers back in the summer. But still, making it official counts for something, and the team also used yesterday’s event as an opportunity to unveil their logo and team colors. So how’d they do? Well, the event itself was a disaster, one that featured two failed attempts to play the announcement video. For an agonizing few minutes, it looked like the team had gone with the “Placeholders”. They eventually got the video working, although not before an extended stalling job by a clearly seething Gary Bettman. Oh, and while everyone was waiting the team web site went live and spoiled the surprise. Other than that, it was smooth sailing. But that should all be forgotten eventually. What about the name and logo itself? Well, this being the NHL, we have a long history of new teams to look back on. Many of those franchises ended up being laughable failures, and while you can’t necessarily blame that on a name or a logo, every little bit helps. So let’s look back at some of the lessons learned from those teams that came before, and figure out whether the Las Vegas brains trust managed to get their first major decisions right. What’s in a name? Would a rose by any other name smell as sweet? No, it wouldn’t, because sports teams with dumb names are embarrassing. 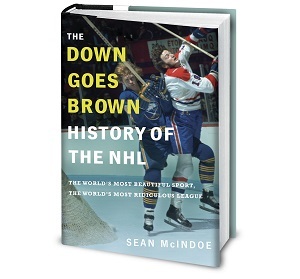 The hockey world has had its share of examples, although to our credit we’ve never hit rock bottom and named a team the Pelicans like some other sports we could mention. Still, this is the big one, and you want to make sure you get it right. The idea name will carry a taste of local flavor, without getting too cute. You want something creative, but not silly. Originality is good, but you can carried away with fancy spellings or singular names that will be confusing to write about. And most importantly of all, you can’t just take the most popular team in the league and try to steal their name. Las Vegas almost made that mistake; reports from August had them leaning towards going with something based on the word “Hawks”. Thankfully, hockey fans laughed at the transparent attempt to hone in on Chicago’s territory and the idea was dropped. Instead, we got the Golden Knights. When it was done right: In general, NHL team names have been getting better with age. They were all over the map in the early days of expansion, largely because they were left to the whims of owners or fan surveys. These days, much more thought goes into the naming process, and we end up with names ranging from the solid (“Lightning”) to the vaguely cool (“Predators”) to the lame-until-someone-explains-it-to-you (“Thrashers”). Personally, I’ve always like Blue Jackets, although I realize I may be in a minority there. When it was done wrong: Sometimes, teams can get too clever, like when Pittsburgh went with “Penguins” even though there aren’t any nearby. Other times, they’re not clever enough, like when Winnipeg’s WHA entry went with “Jets” even though there was already an NFL team called that (and also, Winnipeg didn’t have airports, paved roads or running water until 2013). Both of those names are cool now, but it took some time. But nothing has ever been worse than when the new Anaheim franchise named itself after a terrible Disney movie, christening themselves The Mighty Ducks in 1993. Everyone over the age of six hated it, and the team dropped the “Mighty” in 2006. How’d Vegas do? : We’ll give them a “not bad” here. Golden Knights is a reasonably cool name. Most fans will just call them the Knights, which has long been the go-to choice for kids who needed a fake name for a team in a computer sports game that wasn’t already being used somewhere. And “Vegas Knights” is kind of a pun, I guess. Sure, something about gambling would have been better, but the NHL apparently said that was a no-go, so here we are. Owner Bill Foley went further in the press release, babbling on about how “We selected ‘Knights’ because knights are the defenders of the realm and protect those who cannot defend themselves. They are the elite warrior class.” That’s nonsense, the sort of thing that a marketing department with too much time on its hands comes up with and slips into a press release when nobody’s looking. But Foley clearly never actually said that, nor did any other actual human being, so we won’t hold it against him. One interesting note: The official name drops the “Las” from “Las Vegas”, which is kind of weird. You just know they’re going to get all cranky whenever anyone calls them the Las Vegas Golden Knights. So let’s all agree to do that as often as possible. I thought they named themselves as an homage to the New York Golden Blades/New Jersey Knights of the WHA.